February is a month that can strike fear and loathing into the hearts and minds of singletons worldwide. Feb. 14—an emblematic celebration of romantic love—can leave those of us without significant others feeling left out. Having children helped me reframe the meaning of Valentine’s Day. For my family, the emphasis shifted from a narrow focus on romance to a day that extols the virtues of love in its myriad forms. When my children were little, it became a day filled with heart-shaped food, heart-themed decorations, token gifts, homemade Valentine cards and general silliness. In my mind it combined all the best elements of other major holidays with none of the attendant pressure. I’ve found that not having just one special someone, but celebrating with lots of people I love, makes the day much lighter and brighter. In addition to Valentine’s Day, February is also American Heart Month, a time to think about how to better care for the body’s hardest-working muscle. It is in the spirit of this month, which is short but full of fun and surprises, that I share my family’s favorite Valentine’s Day foods. First up is the ever-popular breakfast dish with a twist. Whether you call it Egg in a Hole, Egg in a Basket, One-Eyed Jack or Pirate’s Eye, the combination of an egg cooked in toast is a classic. 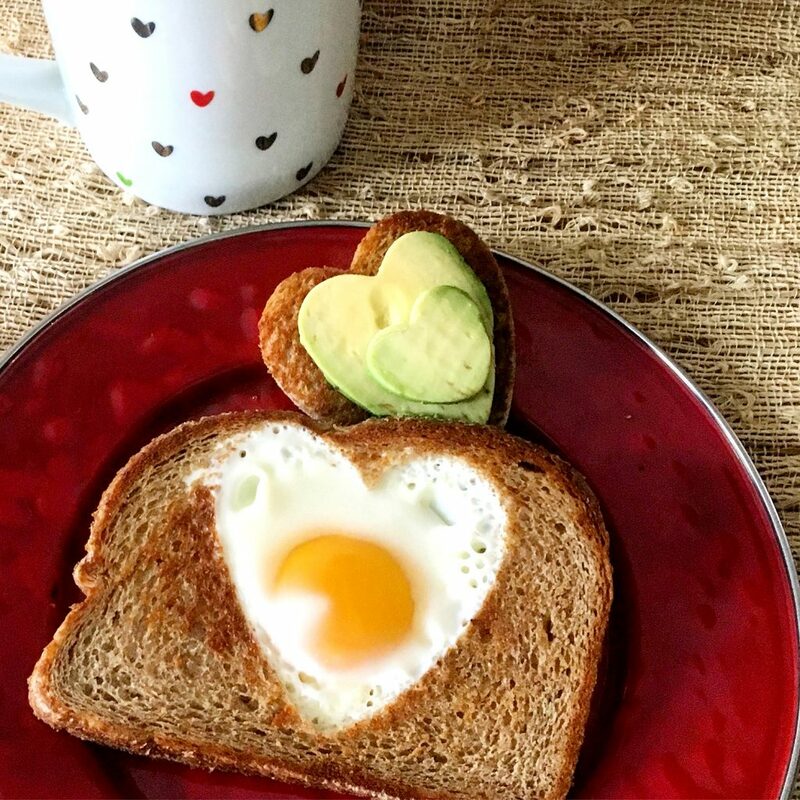 On Valentine’s Day, I simply cut the hole with a heart-shaped cookie cutter to make my son’s favorite breakfast ever—Egg in a Heart. Toast whole wheat bread lightly, use a cookie cutter to create a heart-shaped hole and then put it in a small non-stick skillet on medium heat. Drop the egg in the hole and cook over medium heat until the egg white sets. Serve the toasted heart with your favorite jam or jelly. 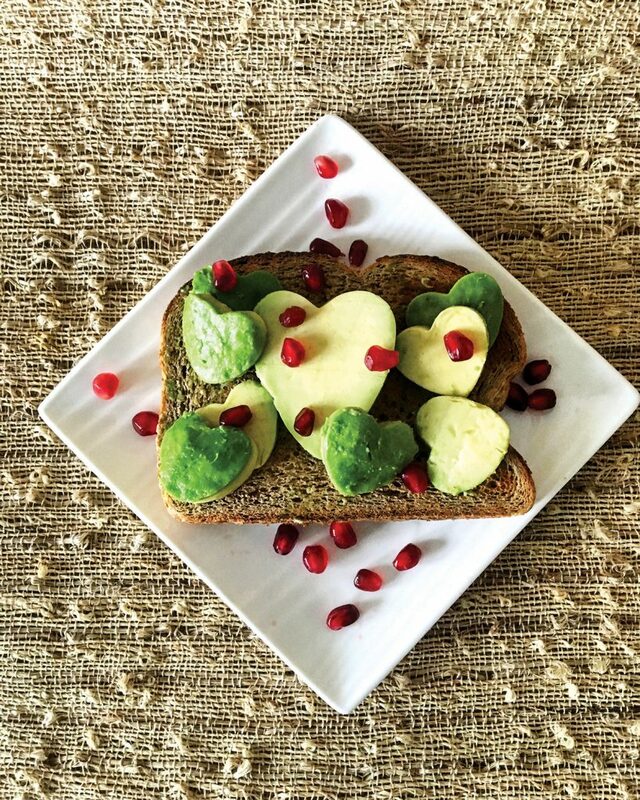 Or to make this protein-rich breakfast even more heart healthy, top your heart toast with a slice of avocado! Which brings us to my own year-round favorite breakfast—avocado toast. Avocados bring so much more than great taste to the table. They are a powerhouse of healthy, monounsaturated fats, which can help lower LDL, or bad cholesterol, levels. They also provide dietary fiber, B vitamins, potassium and vitamin E. Bonus points on Valentines Day, avocados make pretty hearts in a number of sizes. I sprinkle mine with pomegranate seeds for color and even more great taste. February in Maine calls for meals that warm the tummy as well as the heart, so our go-to on Valentine’s Day is chili. 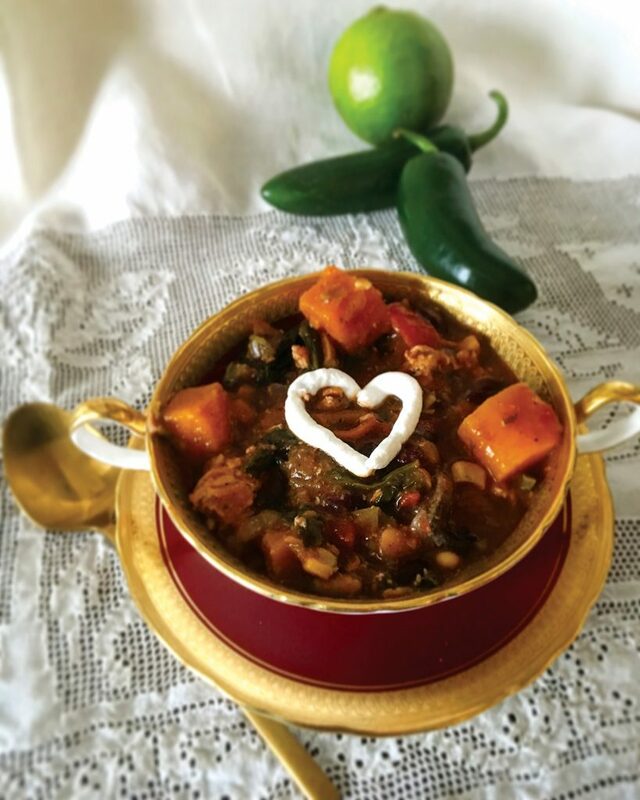 But not just any chili, I load mine up with veggies and lean protein to make it the perfect “love your heart” meal. In a large Dutch oven add 2 tablespoons of olive oil and sauté protein over medium heat until cooked through. Set aside. Add remaining olive oil and cook onions, mushrooms, squash and garlic until onion is translucent, about 8 minutes. Add chili seasoning mix and liquid (wine or vegetable stock) and simmer for 2–3 minutes. Add all remaining ingredients, including protein, to the pot and bring to a very gentle boil, stirring often, until spinach has cooked down, about 5 minutes. Simmer on very low heat until squash is fork tender and flavors have melded, stirring occasionally, about 30 minutes. Add liquid if needed. Remove from heat, cover and let stand for about an hour. Heat before serving. Garnish with a dollop of Greek yogurt, fresh chopped cilantro or shredded cheese. This chili is delicious if made a day ahead and refrigerated overnight. You might want to make a double batch and freeze half for another night. And what is Valentine’s Day without a bit of indulgence? I make Lazy Girl Truffles, a fun and easy homemade sweet treat that the kids can help make. Using store-bought cookie dough, roll dough into balls and bake according to directions, but cook 2 or 3 minutes less than directions call for so that the middle of the cookies are soft. Let cookies cool until just warm, about 5 minutes. Butter your hands and reform cookies into balls. In a glass bowl, microwave 12 ounces of chocolate chips—dark, milk or white—until melted and smooth. Dip cookie balls into melted chocolate and cover thoroughly. You may have to reheat chocolate as you dip your cookie balls. You can top with red sugar crystals, crushed peppermints, or cinnamon hearts. Refrigerate for 10–15 minutes to set. 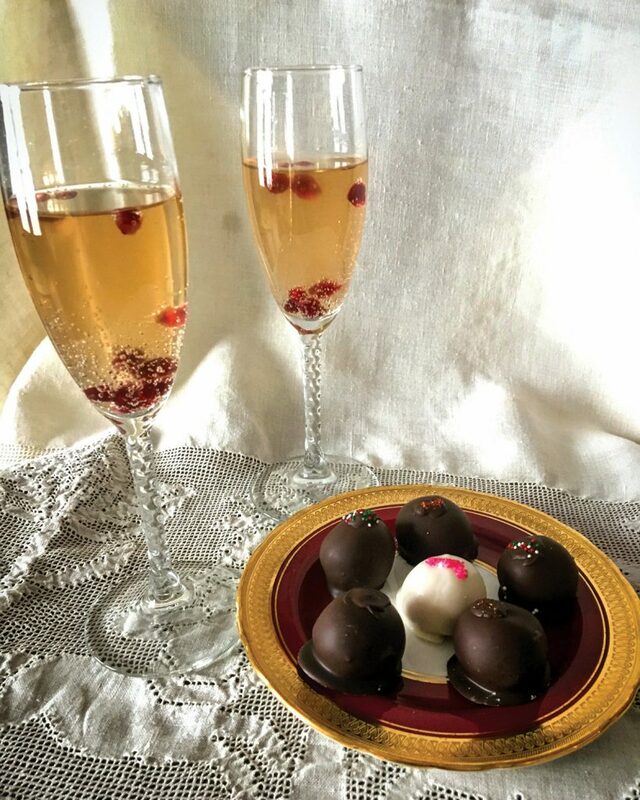 Serve with ginger ale in festive glasses and add pomegranate seeds or frozen raspberries for color.